Kalas had three sons: Todd, Brad, and Kane. Todd Kalas was a Phillies broadcaster, worked as a pregame/postgame–show host, and is currently an in-game analyst for the Tampa Bay Rays. On May 15, 2009, during a series in Washington, the Phillies visited the White House and were congratulated by President Barack Obama for their 2008 World Series championship. The visit had been postponed from April 14, due to Kalas's death the preceding day. The President mentioned Kalas, his voice, his love for the Phillies, and his legacy. This was the second of two tributes to Kalas in Washington. On April 21, eight days after Kalas's death, then-U.S. Congressman Joe Sestak paid tribute to Kalas in the House of Representatives. At the time, Sestak represented Pennsylvania's 7th congressional district, where Kalas resided. Other broadcasters have used Kalas' "outta here" call, including Gary Cohen of the New York Mets, Jerry Coleman of the San Diego Padres, and Terry Smith of the Los Angeles Angels of Anaheim. The 3–2 pitch ... Swing, and a pop-up, this game is gonna be over ... Carlos Ruiz squeezes it, and the Phillies are the National League champions! The Phils move on to the World Series! Kalas had sung "Take Me Out To The Ball Game" on several occasions during the seventh-inning stretch at Wrigley Field in Chicago on several occasions in tribute to Harry Caray, the late voice of the Chicago Cubs, who had led fans in that song at most home games. 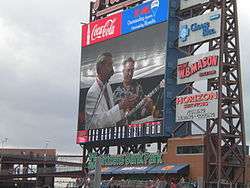 However, by that time, Kalas, a native of the Chicago area, had become an openly-avid Phillies fan, and held the microphone out to the audience to hear them sing "the Cubbies" as they replaced their team's name for "the home team" in the song's lyrics. He also narrated/commentated Animal Planet's Puppy Bowls I-V from 2005–2009. Puppy Bowl VI was dedicated in his memory. ↑ Reed, Robert (1999). A Six-Gun Salute: An Illustrated History of the Colt .45s. Houston, TX: Gulf Publishing Co.
↑ Barron, David (April 13, 2009). "Phillies announcer Kalas dies after collapsing in booth". Houston Chronicle. 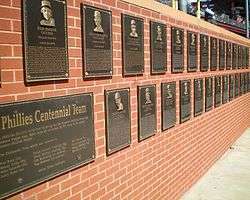 1 2 3 "Official Phillies website: News: Team history: Features: Harry Kalas Tribute". Phillies.MLB.com. MLB Advanced Media, L.P. Retrieved 2009-07-27. 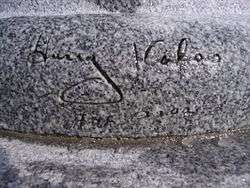 ↑ "Video of Harry Kalas throwing out the first pitch on April 8, 2009, just five days before he would die". ↑ Zolecki, Todd (2009-05-15). "Phillies lauded for '08 title at White House: President Obama praises club for inspiring postseason run". Phillies.MLB.com. MLB Advanced Media, L.P. Retrieved 2009-07-27. 1 2 3 4 Miller, Randy (2010). Harry the K: the remarkable life of Harry Kalas. Philadelphia: Running Press. ↑ "Rep. Sestak reads statement honoring Harry Kalas into Congressional Record". US Fed News Service. via HighBeam Research (subscription required). 2 July 2009. Retrieved 1 April 2013. ↑ Bodley, Hal (April 13, 2009). "Kalas' call continues to resonate". MLB.com. Retrieved June 12, 2010. ↑ "Video of Harry Kalas calling Mike Schmidt's 500th career home run and a tribute to Harry Kalas". ↑ "Radio Stations May Use Announcers for Series". Reading Eagle. February 15, 1981. p. 98. 1 2 NBC 10 News Special: Parade of Champions: 2008 World Series Champions Philadelphia Phillies. Philadelphia: NBC 10, WCAU-TV. October 31, 2008. ↑ Hofmann, Rich (14 April 2009). "Players light up cigarette before game as tribute to Kalas". The Philadelphia Inquirer. Retrieved 1 April 2013. ↑ Goldstein, Richard (April 14, 2009). 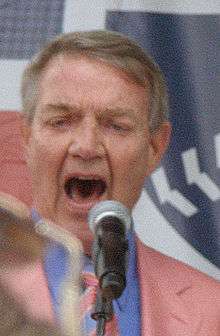 "Harry Kalas, Popular Voice of Phillies, Dies at 73". The New York Times. ↑ Ryzik, Melena (February 2, 2008). "Just Fine as Tackles, but They Can't Pass". New York Times. nytimes.com. Retrieved 2009-09-03. ↑ Seidel, Jeff (2009-04-13). "Phils pull out emotional win over Nats". Phillies.MLB.com. Major League Baseball. Retrieved 2009-04-14. ↑ "Heart disease killed Harry". metro.us. April 15, 2009. Retrieved 2009-09-03. ↑ "Kalas, longtime Phillies voice, dies at 73". ESPN. ESPN.com. April 14, 2009. ↑ Zolecki, Todd (April 18, 2009). "Phillies to host Kalas memorial service". MLB.com. Harry's three sons—Todd, Brad and Kane—threw first balls to Schmidt, John Kruk and Jimmy Rollins, who represented the last three decades of Phillies baseball with Kalas. There was a moment of silence before Kane sang the national anthem. ↑ Gurian-Peck, David (2009-06-17). "Kalas elected to Radio Hall of Fame". Phillies.MLB.com. Major League Baseball. Retrieved 2009-06-17. ↑ Mahon, Tom (2009-11-16). "Honoring Harry". Philadelphia Daily News. ↑ "The "10 Show" on WCAU-TV (NBC-10) segment on statue progress". Retrieved 2010-09-30.